After admitting that older generation iPhones experience a decrease in performance speed, Apple began looking for a solution to ease the frustrations of customers. In addition to offering a reduced price for battery replacements on iPhones with expired warranties, the company also announced that the next operating system release would include a battery health feature. Well, Apple’s newest operating system, iOS 12.1.3, has finally been released and indeed holds the key to checking your iPhone battery’s health. Additionally, the tech giant has created an option for users to disable iPhone battery throttling. First thing’s first: To utilize this new battery health feature, you must update your operating system to iOS 12.1.3. To update your operating system, go to Settings > General > Software Update. Once updated, navigate to the Battery settings by going to Settings > Battery > Battery Health. 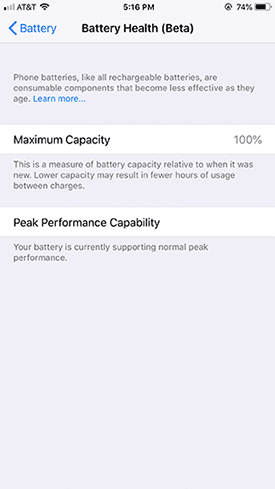 Within the “Battery Health” settings, you’ll see two sections: “Maximum Capacity” and “Peak Performance Capability.” Maximum Capability measures the approximate capacity the battery is able to hold. The newer the device, the closer the Maximum Capacity should be to 100 percent. The “Peak Performance Capability” feature determines whether or not your performance is being throttled. If your battery is in good shape, the text below this feature will explain that the battery is operating at peak performance. In this scenario, you cannot enable or disable iPhone battery throttling. If your battery is operating below 100 percent capacity, your Peak Performance Capability is likely enabled. The text below the feature will explain that your device has unexpectedly shutdown due to the battery’s inability to deliver essential power. Additionally, it will say that performance management has been enabled to prevent further shutdowns. To disable performance management, tap the “Disable” button next to the blurb of text. NOTE: You cannot re-enable this setting. If your battery capacity is below 80 percent, you can still disable iPhone battery throttling; however, the likelihood that your iPhone will unexpectedly shutdown increases dramatically. You may also notice additional text that explains how degraded your battery is and urges you to visit an iPhone repair center. Wireless World can replace your iphone battery with an iPhone repair and return your device to perfect working condition. For further assistance and iPhone battery replacement services, please reach out to Wireless World and we will get you up and running again! Our team has experience replacing countless iPhone batteries, as well as fixing common iPhone issues like cracked screens, water damage, and faulty charging ports. At Wireless World, our screen repairs start at $49.99! Schedule your appointment today!